On view in the Thinkspace project room are new works by Texan-born, Los Angeles-based artist Michael Reeder in mOMENt. A contemporary portraitist who uses figurative distortions and symbolic dislocations as a vehicle for the expression and examination of identity, Reeder’s controlled chaos is as evocative as it is strategically unsettling. 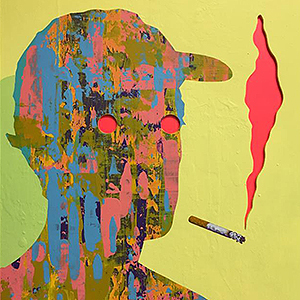 Looking to the depiction of the figure as an exteriorization of the internal self, Reeder’s graphic and stylized works oscillate between moments of reduction and surplus. The artist’s imagery is loose enough to encourage projection and tight enough to direct association by tapping into the subconscious, and its surreal recesses, as a limitless visual resource. By recreating a single subject multiple times, Reeder discovered the poetic potential in seriality and the subtlety of incremental difference: each iteration of the same producing profoundly different results. Moving from flat graphic expanses of space and patterning to more realistically rendered areas, the portrait is positioned as a dynamic, shifting entity, a composite of competing forces colonized by often conflicting imperatives from the realms of the personal, political, and social. As something finite and circumscribed, the figure just like the self is, nonetheless, undeniably infinite as a locus of unwritten potential.